This clock representation shows some of the major units of geological time and definitive events of Earth history. The Hadean eon represents the time before fossil record of life on Earth; its upper boundary is now regarded as 4.0 Ga (billion years ago). Other subdivisions reflect the evolution of life; the Archean and Proterozoic are both eons, the Palaeozoic, Mesozoic and Cenozoic are eras of the Phanerozoic eon. The two million year Quaternary period, the time of recognizable humans, is too small to be visible at this scale. The largest defined unit of time is the supereon, composed of eons. Eons are divided into eras, which are in turn divided into periods, epochs and ages. The terms eonothem, erathem, system, series, and stage are used to refer to the layers of rock that correspond to these periods of geologic time in Earth's history. The term "Anthropocene" is used informally by popular culture and a growing number of scientists to describe the current epoch in which we are living. The term was coined by Paul Crutzen and Eugene Stoermer in 2000 to describe the current time, in which humans have had an enormous impact on the environment--polluting its oceans, killing its species, etc. It has evolved to describe an "epoch" starting some time in the past and on the whole defined by our carbon emissions and our plastic that is left in the ground. Opponents of this term say that the term should not be used because it is very hard, if not nearly impossible, to define a specific time when humans started influencing the rock strata--defining the start of an epoch. Others say that humans have not even started to leave their biggest impact on Earth, and therefore the Antropocene hasn't even started yet. Whatever the case, the ICS has not officially approved the term, as of September 2015. In Ancient Greece, Aristotle saw that fossils of seashells from rocks were similar to those found on the beach and inferred that the fossils were once part of living animals. He reasoned that the positions of land and sea had changed over long periods of time. Leonardo da Vinci concurred with Aristotle’s view that fossils were the remains of ancient life. The 11th-century Persian geologist Avicenna (Ibn Sina) and the 13th century Dominican bishop Albertus Magnus (Albert of Saxony) extended Aristotle's explanation into a theory of a petrifying fluid. Avicenna also first proposed one of the principles underlying geologic time scales, the law of superposition of strata, while discussing the origins of mountains in The Book of Healing in 1027. The Chinese naturalist Shen Kuo (1031–1095) also recognized the concept of ‘deep time’. The strata of any given area represented only part of Earth’s long history. The Neptunist theories popular at this time (expounded by Werner) proposed that all rocks had precipitated out of a single enormous flood. A major shift in thinking came when James Hutton presented his Theory of the Earth; or, an Investigation of the Laws Observable in the Composition, Dissolution, and Restoration of Land Upon the Globe before the Royal Society of Edinburgh in March and April 1785. It has been said that "as things appear from the perspective of the 20th century, James Hutton in those readings became the founder of modern geology". Hutton proposed that the interior of Earth was hot, and that this heat was the engine which drove the creation of new rock: land was eroded by air and water and deposited as layers in the sea; heat then consolidated the sediment into stone, and uplifted it into new lands. This theory was called "Plutonist" in contrast to the "Neptunist" flood-oriented theory. The first serious attempts to formulate a geological time scale that could be applied anywhere on Earth were made in the late 18th century. The most influential of those early attempts (championed by Abraham Werner, among others) divided the rocks of Earth’s crust into four types: Primary, Secondary, Tertiary, and Quaternary. Each type of rock, according to the theory, formed during a specific period in Earth history. It was thus possible to speak of a "Tertiary Period" as well as of "Tertiary Rocks." Indeed, "Tertiary" (now Paleogene and Neogene) and "Quaternary" (now Pleistocene and Holocene) remained in use as names of geological periods well into the 20th century. The process was dominated by British geologists, and the names of the periods reflect that dominance. The "Cambrian", (the classical name for Wales) and the "Ordovician", and "Silurian", named after ancient Welsh tribes, were periods defined using stratigraphic sequences from Wales. The "Devonian" was named for the English county of Devon, and the name "Carboniferous" was simply an adaptation of "the Coal Measures", the old British geologists’ term for the same set of strata. The "Permian" was named after Perm, Russia, because it was defined using strata in that region by Scottish geologist Roderick Murchison. However, some periods were defined by geologists from other countries. The "Triassic" was named in 1834 by a German geologist Friedrich Von Alberti from the three distinct layers (Latin trias meaning triad) —red beds, capped by chalk, followed by black shales — that are found throughout Germany and Northwest Europe, called the ‘Trias’. The "Jurassic" was named by a French geologist Alexandre Brogniart for the extensive marine limestone exposures of the Jura Mountains. The "Cretaceous" (from Latin creta meaning ‘chalk’) as a separate period was first defined by Belgian geologist Jean d’Omalius d’Halloy in 1822, using strata in the Paris basin and named for the extensive beds of chalk (calcium carbonate deposited by the shells of marine invertebrates). British geologists were also responsible for the grouping of periods into Eras and the subdivision of the Tertiary and Quaternary periods into epochs. In 1841 John Phillips published the first global geological time scale based on the types of fossils found in each era. Phillips’ scale helped standardize the use of terms like Paleozoic ("old life") which he extended to cover a larger period than it had in previous usage, and Mesozoic ("middle life") which he invented. When William Smith and Sir Charles Lyell first recognized that rock strata represented successive time periods, time scales could be estimated only very imprecisely since various kinds of rates of change used in estimation were highly variable. While creationists had been proposing dates of around six or seven thousand years for the age of Earth based on the Bible, early geologists were suggesting millions of years for geologic periods with some even suggesting a virtually infinite age for Earth. Geologists and paleontologists constructed the geologic table based on the relative positions of different strata and fossils, and estimated the time scales based on studying rates of various kinds of weathering, erosion, sedimentation, and lithification. Until the discovery of radioactivity in 1896 and the development of its geological applications through radiometric dating during the first half of the 20th century (pioneered by such geologists as Arthur Holmes) which allowed for more precise absolute dating of rocks, the ages of various rock strata and the age of Earth were the subject of considerable debate. The first geologic time scale that included absolute dates was published in 1913 by the British geologist Arthur Holmes. He greatly furthered the newly created discipline of geochronology and published the world-renowned book The Age of the Earth in which he estimated Earth’s age to be at least 1.6 billion years. In 1977, the Global Commission on Stratigraphy (now the International Commission on Stratigraphy) started an effort to define global references known as GSSP (Global Boundary Stratotype Sections and Points) for geologic periods and faunal stages. The commission's most recent work is described in the 2004 geologic time scale of Gradstein et al. A UML model for how the timescale is structured, relating it to the GSSP, is also available. The following four timelines show the geologic time scale. The first shows the entire time from the formation of the Earth to the present, but this compresses the most recent eon. Therefore, the second scale shows the most recent eon with an expanded scale. The second scale compresses the most recent era, so the most recent era is expanded in the third scale. Since the Quaternary is a very short period with short epochs, it is further expanded in the fourth scale. The second, third, and fourth timelines are therefore each subsections of their preceding timeline as indicated by asterisks. The Holocene (the latest epoch) is too small to be shown clearly on the third timeline on the right, another reason for expanding the fourth scale. The Pleistocene (P) epoch. Q stands for the Quaternary period. The following table summarizes the major events and characteristics of the periods of time making up the geologic time scale. 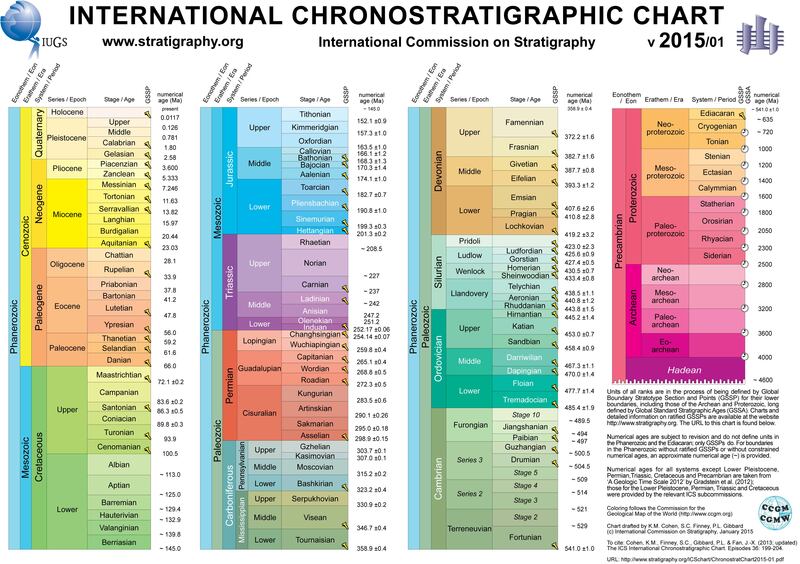 As with the time scales above, this time scale is based on the International Commission on Stratigraphy. (See lunar geologic timescale for a discussion of the geologic subdivisions of Earth's moon.) This table is arranged with the most recent geologic periods at the top, and the most ancient at the bottom. The height of each table entry does not correspond to the duration of each subdivision of time. The ICS's Geologic Time Scale 2012 book which includes the new approved time scale also displays a proposal to substantially revise the Precambrian time scale to reflect important events such as the formation of the Earth or the Great Oxidation Event, among others, while at the same time maintaining most of the previous chronostratigraphic nomenclature for the pertinent time span. ↑ John McPhee, Basin and Range, pp. 113–114. ↑ 27.0 27.1 Dates are slightly uncertain with differences of a few percent between various sources being common. This is largely due to uncertainties in radiometric dating and the problem that deposits suitable for radiometric dating seldom occur exactly at the places in the geologic column where they would be most useful. The dates and errors quoted above are according to the International Commission on Stratigraphy 2015 time scale except the Hadean eon. Where errors are not quoted, errors are less than the precision of the age given. ↑ 32.0 32.1 32.2 32.3 32.4 32.5 For more information on this, see Atmosphere of Earth#Evolution of Earth's atmosphere, Carbon dioxide in the Earth's atmosphere, and Climate change. Specific graphs of reconstructed CO2 levels over the past ~550, 65, and 5 million years can be seen at File:Phanerozoic Carbon Dioxide.png, File:65 Myr Climate Change.png, File:Five Myr Climate Change.png, respectively. ↑ 36.00 36.01 36.02 36.03 36.04 36.05 36.06 36.07 36.08 36.09 36.10 36.11 36.12 36.13 The Proterozoic, Archean and Hadean are often collectively referred to as the Precambrian Time or sometimes, also the Cryptozoic. ↑ 37.00 37.01 37.02 37.03 37.04 37.05 37.06 37.07 37.08 37.09 37.10 37.11 Defined by absolute age (Global Standard Stratigraphic Age). ↑ 40.0 40.1 40.2 40.3 These unit names were taken from the lunar geologic timescale and refer to geologic events that did not occur on Earth. Their use for Earth geology is unofficial. Note that their start times do not dovetail perfectly with the later, terrestrially defined boundaries. ↑ Lua error in Module:Citation/CS1/Identifiers at line 47: attempt to index field 'wikibase' (a nil value). The oldest rock on Earth is the Acasta Gneiss, and it dates to 4.03 Ga, located in the Northwest Territories of Canada. ↑ 44.0 44.1 44.2 Lua error in Module:Citation/CS1/Identifiers at line 47: attempt to index field 'wikibase' (a nil value). This page was last modified on 3 January 2016, at 22:02.